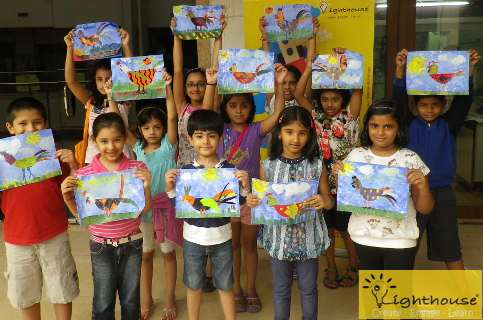 Lighthouse is an Art and Craft Resource Centre which promotes the use of ART in every aspect of our lives. Focus on the PROCESS rather than the outcome. Enable your child to EXPERIENCE THE JOY OF ACHIEVEMENT and the THRILL OF CREATIVE EFFORT! Find the Address & Location of Lighthouse Art and Craft Center near your home. Art Professionals are invited to enroll to start Lighthouse art and craft resource centre. Innovative art and craft products for kids are available for online purchase. Want to Know more about Lighthouse? Deliberate, well-planned and systematic process to build creative thinking and problem solving abilities. Express through process-oriented art: simply put, art that is based on exploration and allows different outcomes. Perseverance is one of the important traits developed by arts experiences, and is essential to achieving success. Visual art engages many areas of a child’s brain, including the parts that control decision making & action planning. Engage in art activities enhance focus and improve child’s ability to interact with the world around us. Kid’s absolutely love sensory art and learning fine motor activities would be great fun. Copyright © Lighthouse India 2019. All rights reserved.